Support From Mark Knight And Dave Seaman To Name Just A Few!! The original promo gained support from top jocks like Dave Seaman BUT... 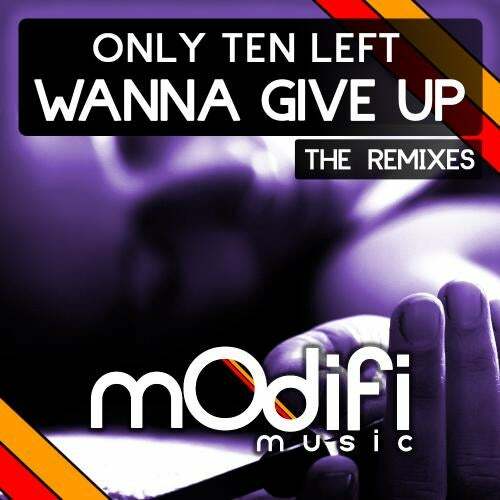 It's time to promo the remix pack to Only Ten Lefts vocal monster, Wanna Give Up. Chris Cooper really does need no introduction by now, his Only Ten Left guise really is one of the labels finest assets and with releases for Chirs coming up on the American giants Nervous Records, the future looks bright for anything he touches (fingers crossed). The original is a blend of BIG ROOM TECH and even BIGGER ROOM PROG, the vocal embraces all of the elements to deliver a monster recording with huge potential. The remixes on the remix pack come from label regulars Adam Byrd and Arkadiusz-S. The Adam Byrd Remix sits beautifully on the fence, somewhere between Deep House, Tech House and Progressive House. His remix of Scrap Shelter he submitted last year gained some huge support with masses of credible chart action and this is even better. Arkadiusz-S is a relative new comer to the MODIFI ranks but still hasn't failed to impress with his Chunky, Tech, Prog Sound. This stonker is no exception to the norm and his remix us bound to flick your switch in the event of a dance floor emergency.